Girl Scout Gingerbread House Earns Award! 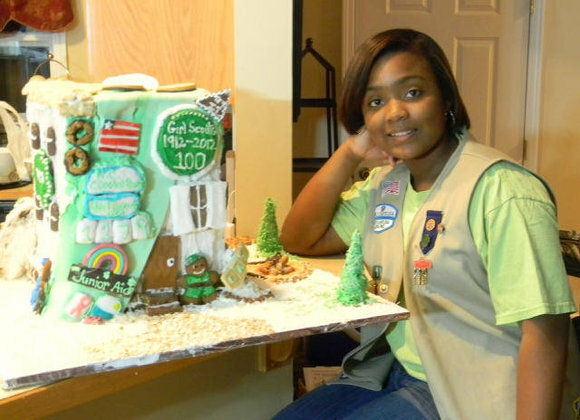 North Carolina's News and Observer reports that Cydni Baldwin's Girl Scout-themed gingerbread house won third place in the youth category of the Raleigh Area Gingerbread House Competition this year. Cyndi draped a green Girl Scout sash made from fondant across her house, complete with badges and her own troop number, 1179. There's a plaque honoring Girl Scout founder Juliette Gordon Low and a bonfire in the yard that represents Girl Scout camp traditions of gathering around a fire and singing songs. The house's windows are made from Thin Mints, while Samoas are rocks that dot the yard. This wasn't her first gingerbread house, and it won't be her last, but she figured now was a good time to pay tribute to the Girl Scouts. "I knew I would not probably be around for the 200th anniversary," she said, laughing, "so I think it's a good idea to celebrate the 100th anniversary."